The Independent is to raise its cover price by 20p to £1.20 next Monday, blaming the pressures of increasing costs for transportation, production and newsprint. The change will bring The Independent in line with The Guardian and The Daily Telegraph, which recently raised their cover prices to £1.20, and leaves The Times as the cheapest quality paper at £1. The Financial Times raised its cover price to £2.50 earlier this year. In an editorial explaining the reasons for the change, Independent editor Chris Blackhurst wrote: "For almost four years, The Independent has not raised its price. During that period, we have faced intense financial pressures. "Inflation has been high and the recession severe and prolonged. Newsprint, transportation and other production costs continue to rise, seemingly inexorably. "Despite that, we have held off asking for more from you as long as we can. 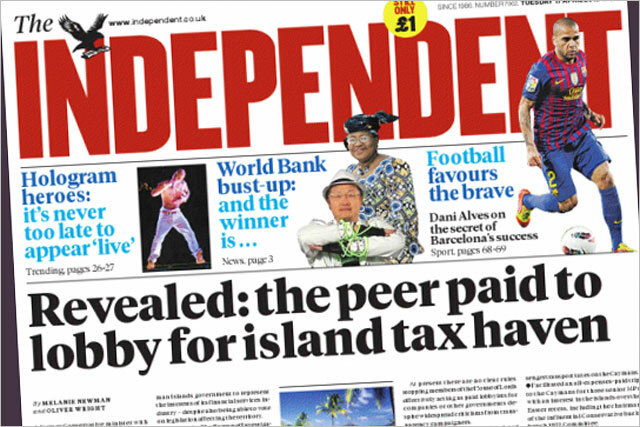 Alas, we cannot hold out any longer – so, unfortunately, from Monday 23 April, The Independent will increase its cover price, to £1.20, bringing it into line with other newspapers." The most recent ABC figures, for March, show The Independent's headline circulation is 100,672 copies. This is down 44.7% year-on-year, with much of the drop down to the ongoing strategy of shifting bulk copies from The Independent to its 20p stablemate i. The cover price of the Independent's Saturday edition will remain at £1.60.